I have 3 race recaps I still need to post, and while I know I could just not post them, I really like having them for my own benefit and to look back on. It's a great way to keep track of the races I've run and the ones I've loved. 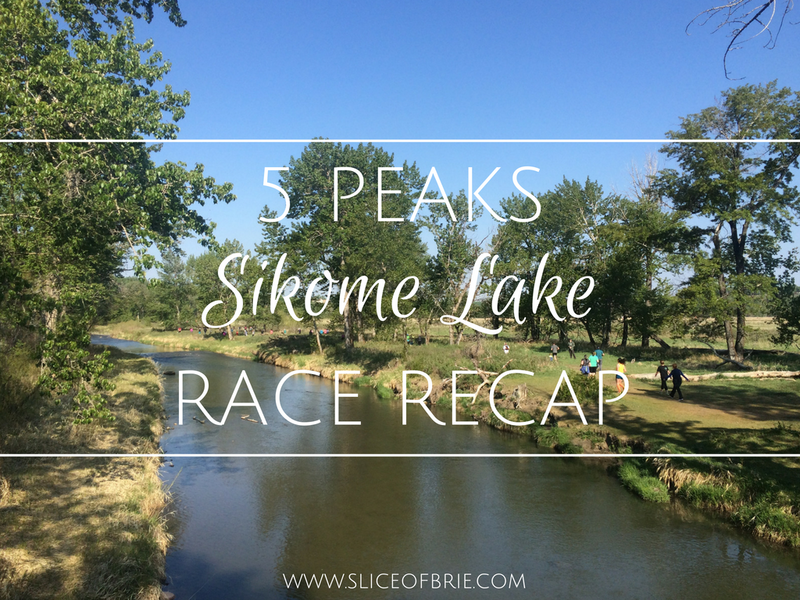 Back on May 14th, I ran my very first trail race run, the 5 Peaks Sicome Lake Race! I have never run a trail race before, but I have always wanted to. When I found out Ange was running this race, and that it was really close to my home, I signed up just a few days beforehand! Ange picked my up bright and early that morning so that we would have no problem finding parking at the venue (parking is somewhat limited), and carpooling is recommended. I had picked up our race packages the night before, but we would have been fine getting them the morning of as this is one super organized event! The 5 Peaks runs are capped at 500 participants, so it's not overly crowded or chaotic when you get there. We had plenty of time once we arrived to use the porta potties and watch the kids 1k and 3k races - man kids can run fast! It was really cool in the morning, but we both knew we'd warm up as soon as we hit the trails, so we ditched our extra layers in Ange's car right before lining up at the start line. This course is an out and back course and just over 6km. I didn't wear trail shoes because even though it's a "trail run", I knew that runners would be ok given the conditions of Fish Creek Park (the trails are pretty smooth). I didn't go into this race with any time expectations, but I was super grateful that Ange had the same approach and ran with me the whole time. The course starts out with a HUGE hill which most people walked up (thank goodness!). Soon after, there's another down hill and then the trail flattens out. There was one water station mid-course that also had these delicious fruit chews! Such a nice surprise! At this point, the trail narrows to a point where there is only room for one runner to run. This was also the point where the turn around for the race starts happening so it was a little bit stressful having to move out of the way for the returning runners (who even has the right away - I still don't get it?!). Somewhere on our way back to the finish line (before we had to head back up the steep hill we came down), I tripped and fell! I didn't hurt myself and bounced right back up, but it was a tad embarrassing as other racers ran by asking if I was ok. I was also 7 weeks pregnant at this time, and my first reaction was "don't tell Jim I tripped!" Haha! Ange and I crossed the finish line together at 51:54 - which is pretty good considering we had to walk the hills and talked almost the entire way! I say it every race, and I'm going to say it again, it's so nice when you are able to run along side a friend! So thanks Ange! When you cross the finish line at a 5 Peaks run - that's when they give your swag, aka, "medal", which was a a super cute camping mug! What a great idea for a race medal! 5 Peaks strives for a zero-waste event, so the mug came in extra handy when we lined up for our fresh cut fruit (also a great post-race idea!). I won't be doing any more trail runs this year, but I'd love to return next year and try to complete the entire 5 Peaks race series. The series consists of 5 races throughout southern Alberta, but they have a race series in other areas/provinces as well, so check it out here if there is a series near you! Trail running is a lot of fun and a completely different vibe from a regular race, and I really can't say anything negative about this particular race/series. Have you ever run a trail race? Runners, do you prefer road races, or trail running, or both? Cooking Made Easy with Chef's Plate! A Slice of Brie Book Club: September's Pick! Book Club Postponed to Tomorrow!